mathestate is a proprietary set of data-driven mathematical analysis tools designed to analyze investments using real data and custom formulas. mathestate and the tools available are free, but before downloading or using the tools be sure to read the legal section. Get started! Click on TOOLS now. mathestate is divided into Financial and Real Estate sections. The financial section of mathestate highlights the Levy stable distribution as a tool for examining risk and expectation in the heavy-tailed returns which are seen in financial data. Each page is created with a Mathematica notebook that can be downloaded to examine the algorithms in detail. A free stable distribution software package supplements the notebooks. Mathematica, however, is not needed to view the site and follow the tutorial on stable distributions. Start Financial tools now! Real Estate follows Roger J. Brown's book Private Real Estate Investment-3rd Edition January, 2018 and is now available in a number of formats. Go to Real Estate tools now. The three part series: The Case for Decision Trees in Partition Actions , The Dilemma and And the Winner is... is available for download. The third edition of Private Real Estate Investment is available for download. A copy of Entropy: What Kind of Bet is Real Estate - Really? is available for download. An interactive Decision Tree Model is available for download. The Worst of the Best of Roger J. Brown is available for those with an e-reader and 99 cents to waste. An analysis of the Sally Clark legal tragedy may be downloaded here. An Excel file titled "ModelingRisk.xlsx" is now available that includes a stable psuedo-random number generator which permits the user to demonstrate alternative probability distributions, compute quantiles and more explicitly model variation in the IRR and Net Present Value. The user's manual for the file may be downloaded here. Several new special topics appear interactively. One is on the true cost of mortgage funds. Another is about the historical term stucture of interest rates. A third is an examination of the depth of the real estate crash. There is also a discussion of refinance benefits and costs. Each of these require your browser to have the free CDF Player plug-in from Wolfram Research. mathestate founder Roger J. Brown announces the publication of the 2nd Edition of Private Real Estate Investment. Read the Preface for a description of the print, electronic and interactive versions. Visit the Table of Contents for more information about what is inside. The entire book (16 chapters) or Part I - The Basics (Chapters 1-5), Part II - Risk Analysis (Chapters 6-10) or Part III - Special Topics (Chapters 11-16) may be found at Amazon. Electronic versions of the entire book, Part I, Part II or Part III are also available. In the ongoing search for a more appropriate risk measure for real estate, an illustration of Spectral Risk Measures has been added to the Wolfram Demonstrations Project. To further the study of heavy tails and sums of random variables, note the addition today of the Generalized Central Limit Theorem to the Wolfram Demonstrations Project. A new tool is provided in Wolfram Demonstrations. It demonstrates the sobering reality of planning for retirement in an inflationary environment using Inflation Adjusted Yield calculations. A new tool is provided in Wolfram Demonstrations. It shows how forming efficient frontiers from assets having non-normal return distributions is an exercise in futility. Two new tools are provided in new Wolfram Demonstrations which describes the problems associated with Simulating the IRR and an economic history contained in the Term Structure of Interest Rates. Two new tools are provided in new Wolfram Demonstrations. One shows how to test the legitimacy of capitalization rates using the probability that expense ratios are consistent with different markets. The other describes the idea of real options. As presented at the Graybill VIII conference on Extreme Value Analysis, mathestate offers complete details of a new mixture distribution providing an accurate fit to financial data. A tool for testing the sensitivity of each parameter in the NPV calculation is provided in a new Wolfram Demonstration. To assist those interested in infinite variance models, mathestate now provides, in a Wolfram Demonstration the Granger-Orr running variance test. A simple algorithm for modeling stable distributions where alpha > 1 is provided in a new Wolfram Demonstration. mathestate now provides a New Market Risk Paradigm using Volatility measured as Stable Gamma. The stable distribution computed with the Zolotarev Integral is displayed at the Wolfram Demonstration Project. Just in time for Christmas, the stocking stuffer everyone is asking for, a Wolfram Demonstration explaining the number of constants needed to fit an elephant. Art De Vany describes the Palin Effect in Intrade Presidential Election Futures Market in terms of extreme events. Regular election prediction can be found here. A fiction science short story called "The Point" may be downloaded here. One solution to the subprime loan crisis using options is described at the Wolfram Demonstration Project. A new statistical distribution modeled as the product of a lognormal random variable and a stable random variable provides an improved fit to market data. Applying stable laws to the Iowa Electronic Markets, mathestate now offers the 2008 Presidential Election Futures offering a prediction model based on a real auction using real money and updated mathematics. The Wolfram Demonstrations Project now has Stock Price Probability with Stable Distributions available for download. Announcing a major revision, mathestate now provides two new features. Under the Financial section users can download custom software in the form of Mathematica notebooks. For Real Estate, mathestate now points users to the Wolfram Demonstrations Project. Users can download free Mathematica Player from Wolfram Research and run any mathestate demonstration on the Wolfram site. 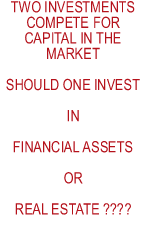 Free Financial Market Analysis Software is now available in the Financial section. This software uses an entirely new measure of risk. Hugh Kelly, CRE, Clinical Associate Professor of Real Estate at The Real Estate Institute of New York University publishes a review of Private Real Estate Investment in Volume 3, No. 90 of The Real Estate Review of NYU. The book, Private Real Estate Investment, that accompanies mathestate.com is now available from Academic Press. A description of the contents may be found under Resources link on the mathestate.com home page. Responding to concerns that real estate prices may be in a "bubble" condition, a mathestate tutorial explains how investors and lenders determine the maximum expansion of a bubble. A demonstration assists in determining if the user's transaction or market is nearing the end of a bubble period and how investors anticipate the next level of growth. Using non-normal stable random numbers, a mathestate tutorial now demonstrates a host of investment "frontiers" (efficient or not) in risk-reward space. mathestate adds tools that estimate non-normal, Stable distributions. Users can now model tail behavior by specifying Stable parameters using a Mathematica notebook. An expanded discussion of this subject, including a "live" demonstration with financial data, may be found in the Financial section. Users can now upload their own data, permitting them to analyze market information they have collected from any source using the many econometric tools provided at mathestate. mathestate launches the most sophisticated real estate investment analysis site available. The first ten tools include: a precise measure of the value of a tax deferred exchange, using a variable holding period to reflect best and worst case returns, partitioning the IRR to distinguish investing from speculating, a way to measure location value and determine the path of progress, a tutorial on non-symmetric probabilities and a way to measure how "honest" a capitalization rate is.